IR filter see. . . and no UV. Horizontally - the wavelength in nanometers. across - the wavelength in nanometers. So what? What does this do for graphics? What does it illustrate? What's vertically? 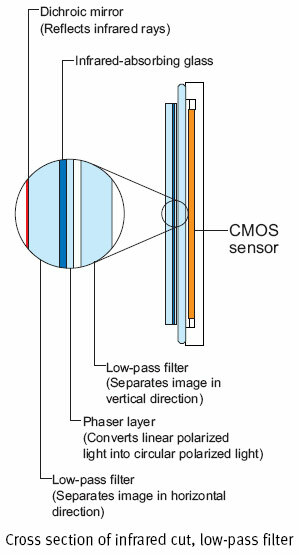 Characteristics filters on sub-pixels of the matrix (the spectral sensitivity of the sensor). Vertical sensitivity R, G and B subpixels. Characteristics filters on sub-pixels of the matrix. Already clearer, and now the big question: What does that mean? What does this do for graphics? It's not graphics. At the axis of the graph is always signed. It is, sorry, Murzilka. I, frankly, too guys are clear what you are trying to prove confusing charts. Never heard of UV-filters in front of the matrix. About Low-Pass filters heard, but they are IR, rather than UV. I believe that the spectral sensitivity senseley modern DSLR-cameras in the UV region of the spectrum are negligible. However, this is not achieved by the presence of UV-filter (which is not), and the properties of silicon and polymer from which pour microlenses. Behold, I am about anything. And the winner is - on DSLR-matrices NO UV-filters because the matrix is ​​not sensitive to UV-range? Prompt, pliz, what did batareyblok (handle) to buy - from Phottix or LinkDeLight? Or until you buy? I Phottix , glitches are not seen to be working, keep handy, stopped to smell bad. Similarly, only with the smell of problems initially was not. And this you know better. and where they took and how much can he, too, different models - I found a HKSupplies, like on ibee: BP-450D Grip for Canon 450D 1000D Rebel XSi XS BG-E5 for $ 56. . .
Phottix BP-450D, took a long time, I do not remember how much, but taking in Moscow in stock. About LinkDeLight - in this branch was not praised, asked about him, but I do not remember that someone has bought. Look for branch 500D, pen for him and 450D are the same, there may be someone bought. In 2700 ibee like complete with two rechargeable battery. or 2450, I do not remember. took the ibey in HKSupplies. 2 weeks after the Oblates already picked up at the post office. or until you buy it? If you do not feel inconvenience without batbloka (normally lies in the hand of the camera) and and buy nothing. I've been thinking to buy or not to buy a pen and not bought. Handle only increases the size and weight of the camera. With regard to the duration of the work, what difference is where the second battery in batbloke or in your pocket? Even the need for additional control buttons for me is questionable - it is at least necessary to change the grip using the second hand, and if photographing fast, somehow not up to it. batblok Buy only if you feel that the camera is uncomfortable in the hand. handle only increases the size of the camera and its weight. Just watched without Batteries cheapest for $ 44, I think. With two rechargeable battery and remote shutter for $ 69 or something. himself was thinking, what to take. On the one hand, the battery, and so I have two, and do not overpay hotstsa. On the other hand - there to poke home Accum somehow pity, and a button-by-wire will not interfere . So weight - additional convenience, oddly enough . Especially with a heavy lens kilo weight . In the sense that there were already complaints about the strange display of remaining battery capacity and better use of the same is likely. So weight - additional convenience, oddly enough. Especially with a heavy lens kilo weight. Batblok balances the whole structure. Lenses with such little weight does not happen, all the same lens will overturn the carcass and one hand down and it will hold on to the lens. But all this, of course, individually. You wonder about the handle. I love the location for shooting portrait people. Without handle very uncomfortable, and with it I have a wound by 85/1. 8 and shutter speed 1/20 (15) shots there. The severity also plays a role. Even prefer to insert the AA akkumy (6 pcs), t. To. They are heavier and with them the center of gravity in the hand, not the end of the lens. It is clear that IMHO. You wonder about the handle. All this individually, and the camera may correspond to any preferences. agree. Well, when there is a choice and accessories for taste and color . ^^^ I'm in the photo do not see him and has already started to lean to the other. . .
just watched without Batteries are the cheapest for $ 44, I think. With two rechargeable battery and remote shutter for $ 69 or something. ^^^ I was going to take no Batteries, t. To. There is one SIDO 300 p. (First call shows itself very well) in addition to the standard and spur written, as I understand what you can and with one. . . pultik and I bought a wireless. . .
just do not understand the difference between a $ 44 to $ 54 - a ledge or something straighter? ^^^ must be compared to the beginning, to feel like. . . In the matter is that while you can not buy both - do not understand . here I am in the photo do not see him and has already started to lean to the other. . . I do not know as there is in the photo, on the handle I see it. Nonstick very uncomfortable, and with it I have a wound by 85/1. 8 and shutter speed 1/20 (15) shots there. The severity also plays a role. IMHO, there can already play the factor that easy carcass strongly shaken cotton mirrors, and increases the weight of the handle that attaches inertia LUBE on cotton less. And on the handles is still something of an additional control, except for the shutter button? for example Yeshe one wheel? wheel works as an additional or duplicate what at the FA? The difference between these two grips is their quality. The cheaper one is with lower quality, the shutter button for auto-focus is not sensitive and it comes with a strong plastic smell. The US $ 54. 00 grip is the high quality one. Voltage regulators on a whale of a subject in keeping always on and off only occasionally or always off, and only occasionally ON? Voltage regulators to keep the whale in a subject always on and off only occasionally or always off, and only occasionally ON? It depends on the shooting conditions. If you shoot with it, especially at slow shutter speeds, the stub often helps out great. If shooting with a tripod, it is best to turn off, like porezche picture becomes. I have, so it is almost always on. A couple of days ago, dynamic scenes filmed at the racetrack and decided to shut down, was not very happy with the result. Although it may be "the curvature of hands" influenced. Before that shot extreme show-enabled Stabia result I liked more. Maybe you mean harm to whether constantly incl. stub chamber, I think there is only a little faster the battery is discharged. Friends, I want to help arrange 450D serial shoot beetle taking off. I find a bug, put next to the camera on a tripod, focus, turn on a continuous shutter mode with a delay, and I go to move the beetle. not know how you can make a full-fledged serial shooting without holding the shutter button. e. I would like to start a production shooting, and at this time to move the unfortunate insect without thinking about the camera at all. camera offers 10 shots (or less) after the 10 seconds timer. Can I otschёlkat 53 after all, for example, 2 or 3 seconds? Or m. B. there is any alternative to this regime? In my head comes only Moodle. . .
trust wiggle bug someone can plant a bug on the electric stove and stir it sticking a fork into the socket . And really such a production shooting, as I described, can not be done by means of the camera, as they say "no hands"? no one. One will shoot.